It's week #23 and I'm still uncomfortable, but hanging in there! Our little one is the size of a bunch of grapes, or a chinchilla! Fun fact! Changes I've noticed: My belly button is really flattening out. That's so gross, it makes me gag. I finally built up the courage to step on my scale at home. I've gained 17 pounds. My Ovia app tells me that this is the point where Baby and I are going to start packing on the pounds! News flash.... I've gotten a jump start. After I post this, I'm going to work on some squats! How I've been feeling: I've been very sore lately. I think it's from the "exercising" I've been doing. I'm not sure I can use that term considering it is the most minimal form of exercise. Regardless, I'm feeling it in the morning! How I've been sleeping: It seems like this past week I've been able to fall asleep a little earlier than usual. This end of the school-year business is knocking me out around 10:30, which is early for me! I've been sleeping pretty well, no complaints really. Food and exercise: I'm back to being STARVING during the day and so full by dinner that I could do without it (I usually don't but my appetite is nowhere near how it is during the day). After I put Ella to sleep I've been seriously craving sweets, which is SO odd for me! My way of indulging is with a giant glass of 4C iced tea...which is sooooo bad I'm sure. The glucose test is coming up, I need to lay off all the sugar! Exercise is still stretching....lots of down dog....trying to work off the arm jiggle with my 6 lb. weights. Not much, but better than nothing. Maternity clothes: Mal made an H&M order, I think I need to follow her lead! Seriously, where are all my leggings? Perhaps I should clean my bedroom before I go ordering stuff. Is there really such a thing as too many leggings though? Movement: All day. Errr day. 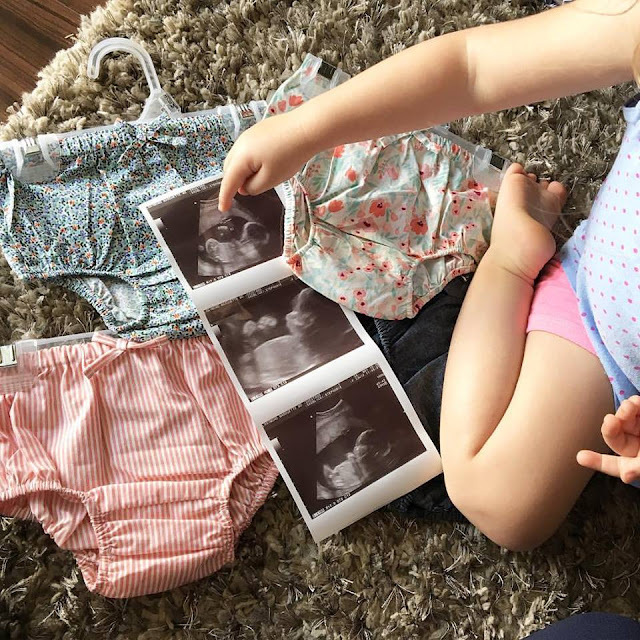 Best moment this past week: On Tuesday I had an appointment for another ultrasound. Last time, they weren't able to see everything they needed. The princess cooperated this time and we were able to see her sweet face again! A bonus peek! I had to take a half-day off of work, so Hubs and I had some quality time together and had a lunch date. Afterwards I went on a little Old Navy shopping spree and got a bunch of bloomers for our girl. Believe it or not, I haven't bought anything for her yet! She has plenty of hand-me-downs from Big Sis of course, but she needs some special goodies of her own! 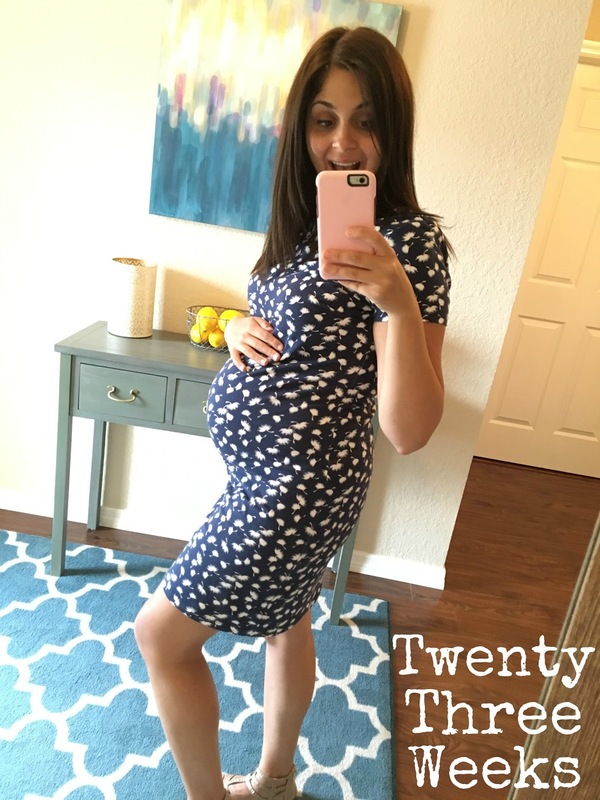 Click HERE to check out 23 Weeks with Ella Rose!